TWA Flight 513, registration NC86513, Star of Lisbon, was a Lockheed Constellation operated by Transcontinental and Western Air on a training flight on July 11, 1946 when it crashed near Reading, Pennsylvania. Electrical wiring in the baggage compartment arced, starting a fire. The smoke and intense fire created made it impossible for the pilots to maintain control of the aircraft. Of the six crewmembers aboard, five were killed. 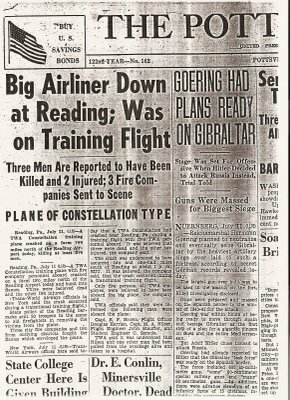 This accident is memorable for grounding all Lockheed Constellations from July 12 until August 23, 1946 when cargo fire detection equipment could be installed. The crash was referred to in Martin Scorsese's film The Aviator, based on the life of TWA's then-owner, Howard Hughes. 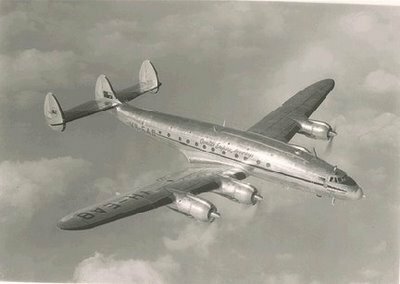 The Constellation, named "Star of Lisbon" departed Reading Airport at 11:21, for a local instrument training flight. The aircraft climbed to an altitude of 3,000 feet to an area approximately four miles east of the Reading Airport at which time it leveled off to begin practice of instrument approach procedures. Shortly thereafter, the flight crew detected an odor resembling burning insulation, but did not immediately determine the source. At approximately 11:37, the slight engineer went aft in order to determine the origin of the smoke. Upon opening the galley door, he observed that the entire cabin was filled with a very dense smoke. The crew immediately attempted to combat the fire with the cockpit fire-extinguisher but were unable to enter the cabin because of the dense smoke and intense heat. The smoke quickly filled the cockpit through the open galley door, rendering visibility extremely poor and making it difficult for the pilots to observe the instruments. The student flight engineer opened the cockpit crew hatch in an attempt to clear the cockpit of smoke, however, the opening of the hatch increased the flow of smoke from the cabin toward the cockpit and shortly thereafter it became impossible to observe any of the instruments or to see through the windshield. This is the story of an airliner that crashed near Reading Airport, 62 years ago. Although Reading isn’t really in the coal region of Pennsylvania, it is close enough to for two reasons, it contains some good eastern Pa. history and it satisfies my passion for writing and talking about old prop driven airliners. The “Star of Lisbon” the name stenciled on the nose of the Aircraft by TWA was the third Constellation to catch fire and crash land in the last 10 months. The first was an Army plane manned by a Pan American Crew and went down near Linn, Kansas in September. Another Connie owned by Pan American lost an engine and just made it into Willimantic, Conn.